t’s already no secret that Linux tends to dominate as the operating system of choice on the world’s fastest supercomputers, but the release on Monday of the 40th edition of the twice-yearly Top500 List of the world’s top supercomputers made that connection more clear than ever. 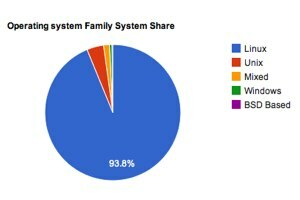 A full 469, or 94 percent, of the top 500 supercomputers now run Linux, according to the Top500 November report, compared with 462 in theJune edition of the twice-yearly evaluation. Just 457, or 91.4 percent, of the top machines ran Linux a year ago. Meanwhile, only three of the world’s top supercomputers in this latest report — ranking at No. 132, 165 and 183, respectively — run Windows, compared with just two in June and one a year ago.